These are very easy to make — Lyra often does them by herself once I assemble the elements for her. Wash and rinse the rice in several changes of water, before cooking it in 5 cups of water. When the rice is cooked, transfer it to a large wooden bowl. Pour the vinegar mixture over the rice and stir it in, fanning the rice at the same time to cool it quickly. Lay a sheet of nori on a sushi mat or large square of clingfilm. Spread the near two thirds with a layer of rice, then lie a piece of cucumber across it and sprinkle with sesame seeds. Lift the edge of the mat, and roll the nori and rice over on itself, continuing to edge it along until you’ve used all the mat and the roll is sealed. Repeat with the other five sheets of nori. 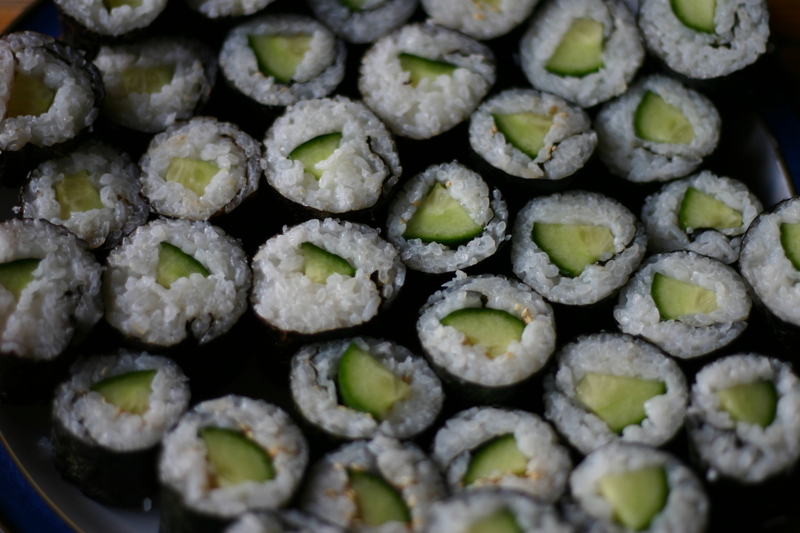 With a sharp knife, slice the maki roll into inch-long sections, and arrange cut side up on a plate. Serve with soy sauce and wasabi.